today's giveaway is one of whimsy and wonder. these prints will make you bust out your creativity and your crayons. yay for bright colors and childhood delights. such an endearing print. 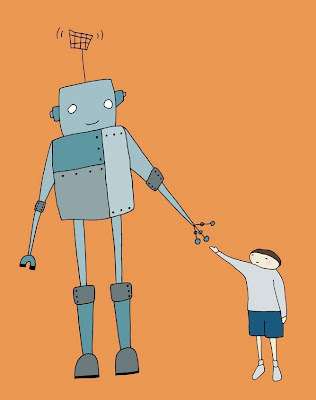 i love mr. robot and his small friend. i have to admit, this one spoke to me. yay for boys named benjamin. this print is perfect for my mom. she got a cruiser for mother's day. i might like to give this one to my bff whitney, she's in yellow and i'm in pink. and i'd tell her i'm the wind beneath her wings. hee hee. these pretty prints come from den-10 studio, featuring art & illustrations by karyn denten. i love the giant happy robot, beach bikes, swinging best friends, and the unique handwritten prints. karyn's prints feature the simple moments of youth, when life was full of energetic joy and imagination. these are perfect pieces to display in a child's room or in an art studio, sometimes a breath of fresh air is all i need to feel inspired. karyn of den-10 studio shop is offering one lucky m.writes reader an art print of their choice! simply leave a comment to enter to win. tell me a favorite thing about childhood. (if you do not have a blog or your blog is private, please include your email in your comment.) comments are open until saturday / may 16 / midnight / mountain time. a random winner will be announced after the weekend. hooray for recess and swing sets and grassy hills and kickball. thank you, karyn, for sharing your charming artwork. I've definitely got a spot for one of these. i'm going to see the beach boys tonight. and i wrote about how my dad bought an album of theirs for my sister and i when we were young on my blog today: www.orangesalad.blogspot.com. definitely not my favorite thing...but time with my dad probably was. oh i love these illustrations. my favorite thing about childhood was having time to imagine. every afternoon my sister and i would meet at the swingset and the backyard would become an imaginary world. the wilderness, the playground, a school, and even the Alaskan tundra. even though i attempt to let my mind run free these days, it's never quite with the same abandon. i love the bicycle print! one of my favorite things about childhood was going to the lake with my family. spending the day in the water and sun. going to bed exhausted at night with a touch of sunburn on my cheeks. these are darling!!! My favorite thing about childhood is not having any worries. You could play all day, laugh with friends, run after the ice crea truck,, and build forts to sleep under....the life!! Lovely prints! The bike one is amazing. Now I don't have that kind of time! these are great. and childhood? time was so much slower and so much simpler then. you could play outside ALL day. and i did. and all day really felt like all day. now all day seems like a few brief flurries of activity. but when you're little, all day lasts forever! I love the BFF print I could give that to my sister for just being her. My favorite childhood memory would have to be me and my sister filling the washer up with water and sitting on the edge with our feet inside and pretending we were at the beach. We would make fruit drinks and wear our bathing suits to get the whole beach effect going on. Oh how I miss those days!! Have a great day!! I loved when I would fall asleep in the car and my dad would carry me to my bed - without waking me up. These are such cute prints! livestock shows and the smell of a clean pig and the starched show shirts and the family together time. I love these prints! They are very cute! My favorite part of childhood was the magic of it all. I was a firm believer in the toothfairy, santa, the easter bunny etc. It was delightful! My Mom made everything special--even our chore charts were whimsical and fun! being with my cousins when the family would all get together at our grandparents. Those are beautiful! I would love one of those in my little girl's room. My favorite thing about childhood is that everything is a new discovery. I love watching my kids amazed by bugs and book and clouds. My favorite thing about childhood was getting dirty. When playing in the dirt was encouraged and skinned knees were cool. I guess I was a bit of a tomboy who would love being outside all day on long summer days. Playing in the backyard, making forts and discovering little pockets of the yard was the best. One thing I miss about my childhood was sitting in the basement on a hot summer day watching tv eating otter pops. I also miss listening to country music on Saturday mornings while my parents make a big breakfast. i love these prints. just darling! my favorite thing about childhood was just spending hours on end doing whatever i wanted. no schedule. no to do list. just me and my bike down by the lake. or a big box of crayons and a fresh pad of paper. being creative and and adventurous. not worrying about a thing. sigh...that was the life. One of my favorite things about childhood was how carefree my summer days were. Each day was magic just waiting to happen and you never knew where it would take you. one of my favorite things was when mom took my sister & me to the library. it was a treasure trove. that was the one place where we could get whatever we wanted. i still remember the dark elevator ride, the stepping stools, and the smell of thousands of books. wish i could go back to that magical building. Up until I started high school, my brother and I would spend every summer in the boondocks of Michigan with my grandparents. We would spend hours every day roaming around the woods and the gardens behind the house. My favorite thing to do there is split equally between picking fresh blackberries and wild strawberries with my dad, catching frogs at the old beaver pond with my brother, and, towards the ends of summer when the stalks got high enough, hiding in the cornfield. I love these prints. 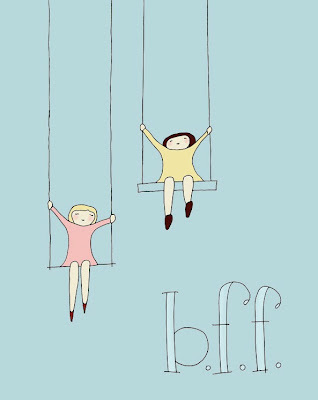 The bff one reminds me of my sister and I playing on our swing set for hours on end in the spring and summer. These prints remind me of the simplicity of childhood which was one of the best parts. Why do we forget to play and relax and laugh and be carefree? one of my favorite things about childhood was freeze tag in front of my house with the neighbors. we used to have so much fun: laugh & laugh & laugh until we were so thirsty that we needed to go inside & get koolaid that my mom mad for us. my favorite childhood memory would probably swinging on our homemade wooden swing in Indiana in the summer wearing Salt Water sandals and eating popsicles. It's too hard to pick one favorite thing from childhood. Something that sticks with me is the tactility of it all. The feel of tree bark beneath the bare soles of my feet, the feel of rain running through my hair and down my face, the strong grasp of my dad's hand around mine, the taste of my mom's homemade sauce on a wooden spoon straight from the pot on the stove, the scent of sunscreen at the lake. As kids we are always experiencing things with all of our senses. I try to remember to do that now. Your blog is new to me and I love it. These prints are great! My favorite thing about chidlhood was living at the swimming pool all summer. I love the robot one and the bff ones is cool too. My favorite memory of childhood was spending Saturday nights with my grandma -- we would bake oatmeal cookies and watch Golden Girls. We would take the bus to the mall and I would get a book at B.Daltin. She would take me to the California state capital and let me walk around the grounds. Always fun. At my wedding she gave me the old mixing bowl we made cookies in w/a batch of our cookies. One of my many favorite childhood memories was roller coaster pretend play. We would take lounge chairs, flip them upside down and hold onto the metals bars like we would on a roller coaster. We didn't actually move, but stationary fun it was! My favorite memory from my childhood was the daycare I attended. They always filled the days with fun activities & 3 of my best friends were there, what can be better?! my favorite thing about childhood was being able to ride my bike 2 miles down the dirt road to my best friend's house and hanging out with her and playing all summer long! kick-the-can, paper dolls, water gun fights, football with my brother, building haunted houses in the basement, riding bikes in the cul-de-sac, sitting on skateboards and interlocking legs to ride down the street, the greenbelt behind our house and the many hours we spent looking for gardner snakes, bubbles in the hot tub, and so so so so much more... I had a wonderful childhood!! love the prints. One of my favorite childhood memories was reading books with my Mom. I loved playing in this big pine tree. It had an opening like a door and my sisters and I would spend hours playing house in there. Definitely my favorite thing to do as a child. love these posters. and one of my favorite things about childhood was going to my grandparents' and helping them peel and preserve peaches. yum! I love the pciture of the girls on the swings! It reminds me of when I was little throwing shoes in the air was the game to see whose would go furthest! Lovely blue skies too! Living with my sister. I didn't appreciate it so much then but now I realize she was my closest friend in our childhood. Beautiful prints! One of my favorite childhood memories was eating fresh tomatoes with my grandparents in the summer. My favorite childhood memories were of going to my gma and gpa's place for a week each summer. Favorite thing from childhood - too many to name (I had a pretty great one) but I'd say my mom meeting us on a big rock at the bottom of the driveway after the school bus dropped us off with a snack - everyday except when we had practices (even in the winter she'd meet us for the walk up the 1/4 mile with hot coco). 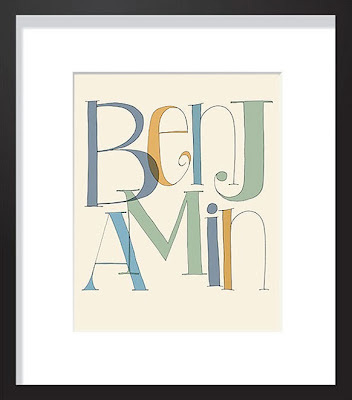 All of the prints are fabulous, but the BENJAMIN print speaks to me the most. Could it have anything to do with my little Ben??? How many things to choose from...but my favorite thing from my childhood was daydreaming while laying on the grass and looking and the clouds. one of my favorite memories: My brother and sister and I used to play in the forest behind our house for hours on end. We new it was time to go in for the night when we'd hear my dad's loud perfect whistle. He'd be smiling, waiting for us on the porch when we got back. It was freedom and adventure, what a lovely childhood I had. Fave thing? Riding those swings till you thought the base would come free of it's pilings!!!! One favorite thing: making and burying a time capsule with my first cousin Emily in the late '80s. Sad part is, we don't know exactly where it's buried...the general vicinity yes, but not exact enough to start digging. I enjoyed walking to church to practice piano. There was something about playing piano in the empty sanctuary that was so calming. I would play for hours. I just moved and could use some cute new stuff for my walls! These are lovely. These prints are so darling! Thanks for sharing. Ah! I forgot my favorite childhood memory! Off the top of my head I thought of laying in the grass with my best friend and pretending we could see unicorns living in the clouds. These are just beautiful! I would love one. I have so many fond childhood memories but one of my favorites is going to the baseball game with my dad. We recently took our daughter for the first time and it brought back so many memories. My favorite part about childhood was the carefree spirit of it all. I never worried about anything! my favorite thing about childhood are the endless possibilities and limitless future. I loved playing in the creek behind our house and building tree forts and doing Indian rain dances in them! skipping, swinging, digging in dirt, otter pops, jump ropes and lazy days at the pool. these prints are gorgeous, marta. my favorite thing about childhood is the innocence of life and the enjoyment found in the simplest and most mundane tasks. the best part of being a parent is being able to 'relive' the magic through one's own children! these are such sweet lil prints! my favourite thing about childhood is the summers we spent at my cottage. my sister and i would make up endless games of make-believe to play, and spend hours (and hours!) in the lake, pretending to be mermaids or fairies, depending on the favourite disney movie du jour. then we'd traipse back up to the cottage, sopping wet and tired, eat barbecued chicken and caesar salad on the deck, and coordinate "concerts" for my parents and any neighbours who would listen. yea for giveaways! never won, but worth a shot. my favorite memory is playing with me twin sister in our grove of trees. we would make believe everything and anything from playing house, pretending to have a model agency, office and playing barbies. that little grove of trees will forever remind me of my childhood! oh my, these are splendid! i would be pleased as punch to win one! Beautiful illustrations. My favorite thing about childhood...the innocence. A favorite childhood memory for me is what my sister and I liked to call “house for a day”. We would choose one place in the house and make a fort and live there for the day. Sometimes it was the closed in back porch, other (sunny warm) days it was the two-story jungle gym in our back yard, another day was even the bathtub. We had so much fun setting up little homes in our forts and visiting each other in our “homes for the day”! Getting roller derby roller skates for my birthday and clumsily skating down my drive way... good times. My favorite childhood memory would have to be our annual Christmas Eve festivities. Our family would go to the carols, candles and communion service at church. drive around and see all the christmas lights downtown. then head to the house of my parents best friends for pizza, games, gifts and reading the "gift of the magi" by the fireplace. These evenings WERE christmas to me---and they epitomize the love and joy of my childhood. My favorite childhood memory is the summer I spent believing I was Pippy Longstocking. I took patio furniture and put training wheels and balloons on it, believing it would fly. That summer I believed I could do anything, and sometimes I still do! My favorite thing about childhood was having a backyard that connect with my best fiends and a bedroom windows that could be seen by each others. We spent everyday together, and if we needed each other at night we could shine one of matching flashlights into the others room. We are still best friends (I am very grateful for that!) Oh but to be able to shine a flashlight and have her right there to talk to in seconds... that was my favorite thing. As a child, I used to play on the side of our house with the leaves from a tree that were surprisingly soft. . . I called it the money tree. Maybe I was trying to prove my mom wrong when she said that's not where money came from. . .
By far, my favorite thing about childhood is making a giant fort in the living room out of sheets and couch cushions. I would bring my toys and books inside and just hide in there for hours, or at least what felt like hours in kid time. Ok, I'm going to admit it, right here, right now. My favorite thing about my childhood was playing Barbies. I love LOVE LOVED playing Barbies. I still would, if it wasn't weird and slightly creepy. Love the prints! One of my favorite things about childhood was spending the day outside. I so rarely do that anymore, but it's always such fun! The "custom name" print is my favorite, and a close second is the "b.f.f." print! My favourite thing about childhood was reading allllllll day long and way into the night. I never could get enough books and I hope my little one loves to read as much as I do. one of the many favorite things about my childhood was that my mom wouldn't allow "selling" lemonade. We had to put "free" lemonade on our chalkboard booth stand. Her intent was to teach us charity vs capitalism. and she did teach us just that. I loved all the art projects we did in elementary school, then hung them up around all the classroom walls. My fave thing about being little was Friday night sleepovers at my grandma's house. We would bake chocolate chip cookies and watch TGIF. I love her house so much that I bought it! I love these! Let's see...my favorite childhood memory is riding my bike around my neighborhood. It was so free and I felt so full of adventure. My favorite memories are of our family trips and vacations. We did a lot of camping and visited Mexico several times too. I've been looking for some very similar prints for my boys' room. I would love one of these! a favorite childhood memory is riding around on my pink and white banana-seat bike! i wish i still had that thing. oh i love the bff! my favorite thing about childhood...having an endless imagination, no fear and energy for everything. eating dozens of otter pops and night games. and thinking the world is completely innocent and charming. Wow- I loved my childhood, it's hard to pick a favorite thing. One thing I remember loving most were the days I could sit at a table on the corner selling lemonade and popsicles... and whatever else I could manage to find around the house... Neighbors and friends were always so generous, they'd pay $1.00 when the price was only $0.25 I remember one time my friends and I made over $40. We took it to the grocery store and stuffed it in one of those little boxes they had at the end of the checkout counter with a picture of a child who was struggling with a certain illness.... I don't remember what exactly it was for, but I remember feeling really good about what we had done! Now, I always try to stop and buy something (even if I don't drink it) just because it was always something that made me smile as a kid. Very cute!! My favorite thing about childhood was getting summers off!! My parents always planned the best summer vacations for us, and then I spent the rest hanging out with friends, staying up late, and having fun!! Oh those were the days! I love them!!! I love the bff beaches tribute. thanks for putting a smile on my face today. catching fireflies in the field behind my house during sunset and waiting until my mom called us to come inside. powerful memories. a favorite thing of childhood for me is the smell of a child's hair after having been out in the sun all day. Love, love, love the Swinging on a Flower one! Thanks for the introduction to a wonderful artist! love them! my favorite childhood mamory is camping. we would camp for two weeks every summer: one week with extended family that included my older siblings and one with my parents and two brothers. we explored some of the most beautiful places in the west. ROBOTS! i love it! My favorite thing about childhood is how once you learn a word, you say it allllll the time. right now my son is on the words "socks" and "duck". every bird is a duck, and all of our shoes are socks. favorite childhood memory... those endless summer days spent roaming the neighborhood w/ your bffs in tow. your call home was the setting of the sun. I love that children don't have the inhibitions that we adults have - especially in regards to what they say and their artwork. Thanks for the sweet giveaway! I miss the mentality of being a child. My only worry: Mom, what are we having for dinner? my favorite memory is going to six flags with my whole family each october! oh man, i think i might have to BEG you to let me win this one. I would love a little print of o's name. man oh man! my favorite memory of my childhood is so hard to pin down. I think it was just not having to worry. Everything was kind of just taken care of - ohhh those were the days! girl you're crazy about giveaways. oh that bicycle one is to die for!!! My fav memories from childhood is creating a movie theatre in the trees with my neighbor. we sold and collected tickets (clovers)!!!! (the only people that came were us. Maybe because we never showed any movies!!! I loved CoLlEcTiNg Kool-aid points all summer. Every summer I was hopeful thatby the end I had enough to receive a cool prize! riding my bike with friends around the neighborhood until the crickets started playing their music. the taste of an ice cold popsicle from the ice cream truck on sweltering hot summer days. those are a few of my favorites! My favortie thing about childhood is no fear in freedom of expression! Would love to win one of those lovely prints!! i loved playing "princesses" with my cousin in our old willow tree -- making our crowns out of the willow branches and pretending the trampoline was "the rest of the world"; i loved sleeping outside, under the stars; dodging the sprinkles all around the house; going on bike rides and visiting my sweet, older neighbor who collected hundreds of salt and pepper shakers; mostly i loved being with my family and "living" at my cousin's house -- there are so many things to love about childhood! 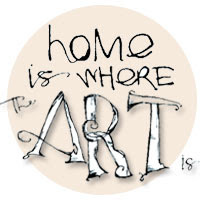 i was sent here via Karyn's blog. 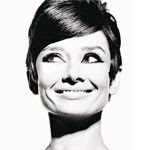 i love her work. 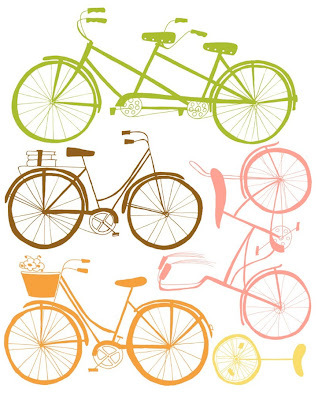 i am especially fond of the bicycle print! your blog is great! it is so nice of you to do this give-away! Wow these are great. The girls on the swingset remind me of childhood summers when I would make lovely mudpies with flower & pebble toppings and bake them in the sun. Until recently, I was under the impression that all kids made mudpies, but my boyfriend informed me it wasn't true. Sad for anyone who missed it! My childhood wasn't that long ago, but the best bit would have been the quizzes dad gave us in the evenings after dinner. We'd get a lolly each time we got a questions right & a few more if we won. these are yummy. thinking over my childhood any memory I came to I distinctly remember being barefoot. riding a bike, barefoot. running on the hot driveway into the cool grass, barefoot. being carefree and barefoot. looking forward to more summer days to come, and maybe a darling print to hang in my daughters room! riding bikes all over the neighborhood---often with no hands! I love these prints! My best memories of childhood involve our yard. It was an amazing place filled with all kinds of berry bushes and fruit trees, a creek to play in, and a tree house. So I'd say that nature was one of my favorite childhood things. My favorite prints are Let's Hang Out and the Robot Collection Print. Thanks for the chance!